This trampoline was originally designed with schools in mind; however, we are sorry to say that we no longer make this model. As we have sold many thousands of these trampolines over the years, we still have parts available for this model. It was one of our most popular trampolines for many years. Now our most popular trampoline is our 14' round Gold Medalist. It offers a much larger jumping surface at a much lower price. NOTE: We still have the same quality product available in a home version at the much lower price of $2695. 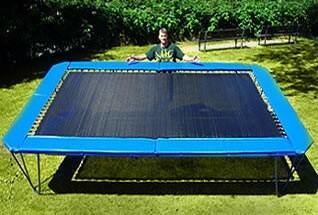 The home version looks very similar to our 11x17 trampoline, only in a 10x14 size. Please call if you would like more information. Excellent durability and performance. Extremely heavy-duty construction with extra-wide padding. The Sundance 10' x 14' Olympic Trainer is double the shipping weight of our round trampolines. The long side rails need to be built with re-enforcing or trussing. This type of framework costs a lot more to build than our round trampoline frames. JUMPING SURFACE: ( 96 Sq. Ft.) Sundance sets the industry standard. The 8' x 12' "air flow" jumping surface is made of the highest-grade, non-abrasive, polypropylene mesh. Designed for permanent outdoor use, this totally weatherproof fabric can be left outside, sun, rain, or snow. SPRINGS: ( 98 - 9") Absolutely the best in the industry! These high performance, heavy duty, galvanized steel springs will last for many, many years. SAFETY PADS: ( 2" x 15" ) Deluxe Plus extra wide padding. Made with industrial grade 18 oz. weatherproof & UV resistant marine vinyl covering fabric and 1.75", high-density closed cell foam. FRAME & LEGS: Super heavy 4 piece double trussed frame rail system, 12 gauge galvanized steel with Legs: 4 - 1 piece U-shaped legs.